I’m just going to admit it: I cannot live without hot dogs or burgers and I don’t care if the high-class, oh-so-sophisticated foodies knock me. Besides, when you’re at Filling Station (now called Station Eats) it’s not your average, weak, thoughtless, passionless, grill-um-up-and-spit-um-out burger and dog shop. This place has chops, character, and a great philosophy behind it: eat well, eat organic, eat local. Let me give you a play-by-play of ordering, so you don’t seem like such a noob (which I ended up seeming like ’cause I forgot.) 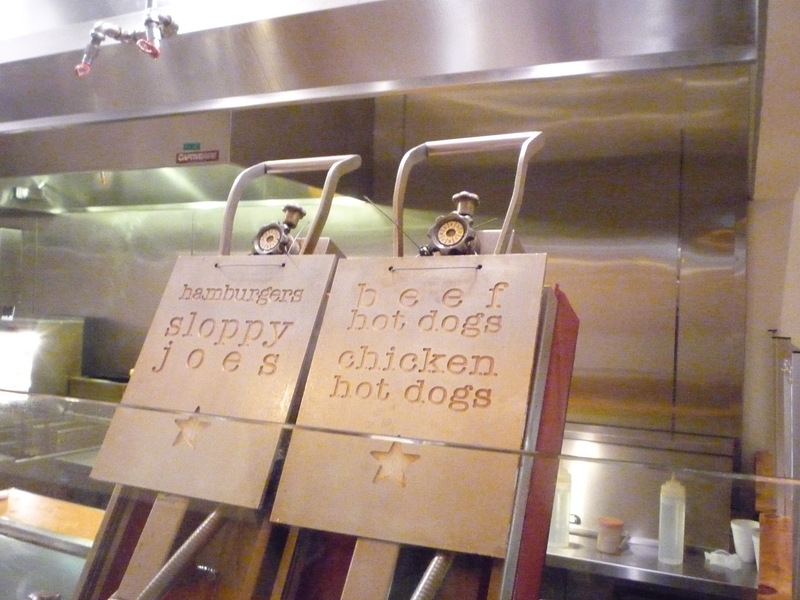 Take a look at the delicious menu that’s posted on the wall when you enter, order one (or more) of two sized burgers, sloppy joe, or dog by the burger presses, then step on down by the register. When your burger or dog’s grilled, they’ll ask what toppings and sauce you’d like to add and help you to customize your own bit of nirvana. You have an arsenal of toppings to choose from, most free, some premium at a dollar per choice. Oh, it’s worth it. Well, we both wanted to try the famed Fall Turkey Burger. You’ve got free range turkey from Lancaster County, tomato, lettuce, fresh sage, thick cut bacon, smothered in a decadent and tangy cranberry aoili sauce. FANTASTIC! Crinkle cut fries with this did the trick: they were crispy on the outside, yet soft right in the middle. Really good fries, and organic too. Their burgers are fairly sized–not too big or small, just right. 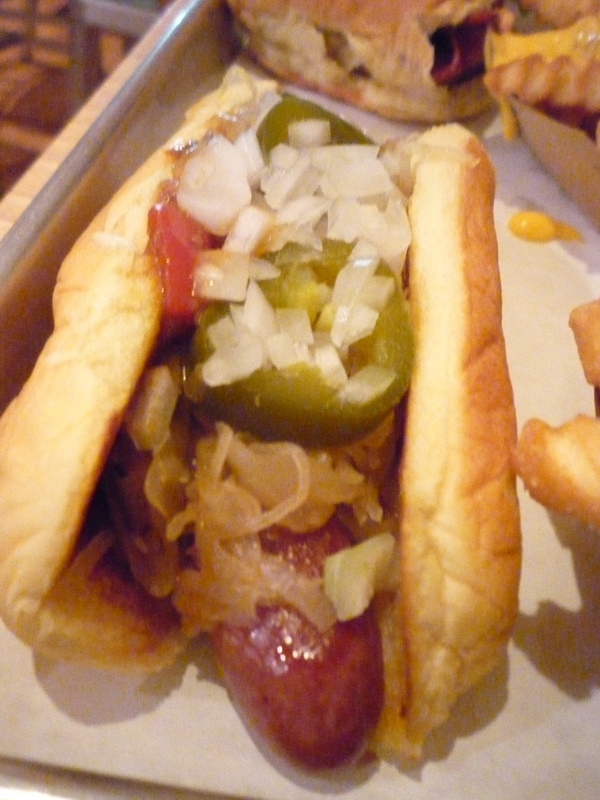 By now you might realize that I can take down my food nicely, so I definitely had to order a hot dog to go with that. I had two premium ingredients on top: chili with beef from local and organic Wolfe’s Neck Farm and apple-braised sauerkraut. To that I added raw onions and jalapenos. The peppers added a nice kick to the pup, the chili gave a nice meaty contrast, and the sauerkraut finished it off with an amazing bite at the end. I was already in heaven, but you really do need something to wash all that amazing food down. Sure, they have water, but one of their specialties here are their nice and thick milkshakes. It just so happens that this month they have a special one that brought me to my knees upon the first sip: pumpkin milkshake. The shake was thick, yet very creamy. The taste was outstanding and spot on. Have you ever tasted a really great pumpkin pie? Yeah, that’s this shake. Well done, because they didn’t overpower you with too much spice. We got to talking with Seth, one of the owners and he shared his passion for his shop and for burgers in general. He’s been all over the country, tasting burgers whenever he can. He has a real love of the restaurant and that exudes from him. Kristien and I talked about coming here when the shop opened when he asked if we had one of the regular burgers and he said that they’ve really been tweaking the burger recipe. Seth asked if we’d like to try them on him, the new and improved versions. Who are we to refuse? Two highlights to my burger: the fried curly onions I asked to be put on top and the fact that it was approaching medium in terms of being cooked. That made the burger juicy, fresh, and flavorful. 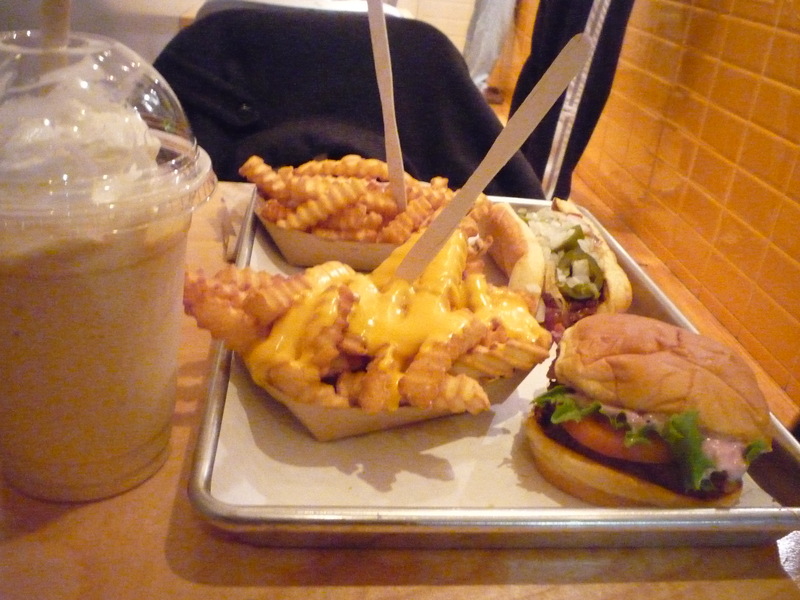 Fantastic burger! Be on the look out because Filling Station has got some great things in the works…you just might see them open up somewhere else nearby soon. If it’s any closer than New Canaan, I might have problems. Serious burger problems! They definitely deserve 4.5 Noms. This is the kind of place that you can go to time after time and still order new variations of a tried and true favorite. I haven’t even tried their sloppy joes yet, so there’s even more reason for me to head back. Very inexpensive, coming in at only $27! Cash or check only, btw. Hello all members – I am a brand-new poster on this here messageboard and I suspect I should introduce myself. Umm, I am 20 years of age, female, plus I study italian in my school. I really look forward chatting with all you older members! Arrivederci for now! Great review. Putting this on my to-do list for getting to know CT. Any tips for my neck o’ the woods? I’m up north in the Hartford area! Hmm, we don’t get up there much. A place that’s a bit closer to you, but is probably still far away, has to be visited at some point. Summer time is best for obvious reasons: Super Duper Weenie! Best hot dogs in existence, truly. That’s in Bridgeport, I know still a while away, but worth the trip. I’m going to have to think a bit and get back to you about some of the other places we’ve been to by you because we did go to Mystic last year.